Eesti Rakenduslingvistika Ühing (ERÜ) kirjastab kaht eelretsenseeritavat ajakirja. 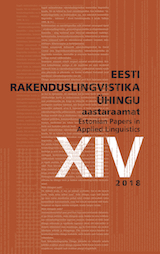 Estonian Association for Applied Linguistics (EAAL) publishes the Estonian Papers in Applied Linguistics, the Yearbook of EAAL. The submissions are expected to cover different fields of applied linguistics. Lähivõrdlusi. Lähivertailuja as an EAAL edition is a series of articles of comparative and second language acquisition research. The journals are pre-reviewed and covered by abstracting & indexing services.